London South Bank University (LSBU) graduate entrepreneur Rotsen Ibarra catered the launch of the Southwark Employment and Enterprise Development Scheme (SEEDS), which was hosted at the Clarence Centre for Enterprise and Innovation. SEEDS is a new project by Southwark Council's Youth Fund that aims to reduce youth unemployment and help businesses in Southwark grow. The initiative encourages local businesses to hire young people who are struggling to find work. 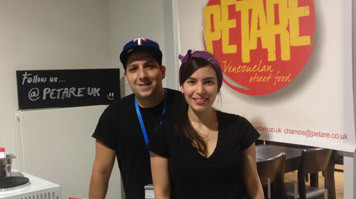 Rotsen is the founder of Petare, a Venezuelan street food pop up and catering service, which he is developing through LSBU's Graduate Entrepreneur Scheme. At the SEEDS event, he supplied authentic Venezuelan food to the over 70 attendees from local organisations and businesses. "The event was a great opportunity as most people attending were business owners and some asked me about catering opportunities. I also got a lot of great feedback on the food, which was very popular," said Rotsen. Rotsen served two types of arepas, which are Venezuelan flatbreads with different fillings. In keeping with the theme of the event, the meat option was named 'The Entrepreneur' and the vegetarian option was called 'The Innovator'. "We were delighted to host Southwark Council and their partners. SEEDS has the potential to make a significant impact in the local community and we were excited to be the centre of choice to launch this important and unique project. And, of course, show off the skills of our graduate entrepreneurs, who provided some very innovative catering appropriate to the theme," said Gurpreet Jagpal, Interim Director of Enterprise at LSBU and CEO of South Bank Enterprises Ltd.